There are two ways you can make changes to the openbox menu. You can edit the menu.xml file, which is usually located with the other openbox configuration files (in ~/.config/openbox/ on Ubuntu 12.04). 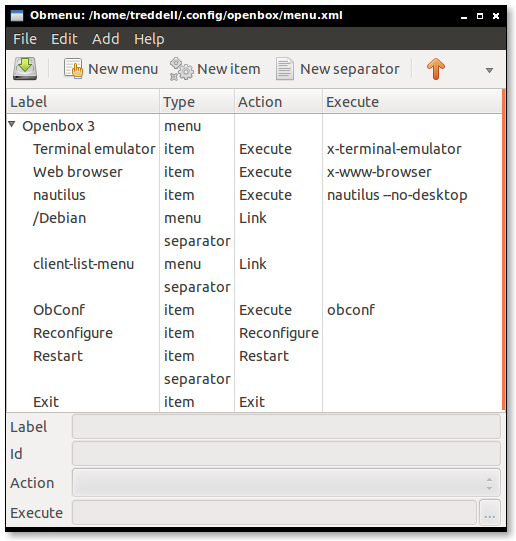 There’s an easier, GUI-based way – using a program called obmenu. Once you have obmenu installed (sudo apt-get install obmenu), simply type obmenu in a terminal. A window like the one above will come up and allow you to change the menu that pops up with a right click on the openbox desktop.